The first half of the year has almost passed - so time to look back at some of the highlights of the last year. The May 2012 edition of Sound On Sound magazine carried a very comprehensive review of the Micro, Classic and Muting DI Boxes - which showed them to be top performers, with many of the technical parameters greatly exceeding the 'benchmark' DI they were directly compared with. This review can be downloaded in PDF format from the appropriate DI Box product pages on the Orchid Web site. It is worth noting that the magazine technical reviewer actually purchased a Micro and a Muting DI Box after completion of the testing. It was interesting to see how far and wide Sound On Sound is read - as orders for these products came in from all over the world - and also introduced new customers to our other products. Our Balanced Microphone Muting pedals have sold well - these are fairly unique items - as silently muting a balanced microphone signal, in the presence of phantom power, demands very careful design. The Lite version has been well received and in use by fiddle players and other instrumentalists using high quality microphones. They are used for replay of backing tracks from computer, or hard disk type replay machines into a PA system. Two synchronised machines are connected - so in the event of the failure of the main machine the DI will change over instantly to the standby. This will be fast, within a few milliseconds - virtually inaudible - and not a beat will be missed. Many bands now use backing tracks, often to 'augment' their live sound - and machine failure cannot be tolerated. Lower cost expander versions are available, if more than 8 channels are needed, these are controlled from the main unit, with no limit to the number that can be added. The annual Analogue To Digital Music Show, now in its 5th year, took place on Saturday 18th May in the Phoenix Arts Centre, in the heart of Exeter. We exhibited many of our products - and it was good to see so many existing Orchid users pop in to say hello! The Phoenix is a major live concert venue in Exeter - with Shooglenifty playing in the same room immediately after the exhibition. They were existing Orchid DI Box users - and purchased a Mic Muting pedal from the exhibition stand! Spiers and Boden were playing the following evening - and in the nearby Barnfield Theatre, Show Of Hands played on 2 consecutive nights to a sell out crowd, the last nights of a completely sold out UK tour. All long time Orchid equipment users. Although we are now well into 2012 - it is interesting to look back and review some of the high lights of 2011. Although it has been a difficult time for some due to the world economic situation, the music industry, particularly the live music sector, has been quite buoyant. The Festival season was generally a great success in the UK and Europe - with good ticket sales and crowds, with many of the major events being sold out long in advance. Our product sales in the early part of the year were very strong as many musicians and PA companies geared up for the season. A number of new products have been introduced during that year, including the Amp Interface which was first produced in prototype form several years ago - but after receving several enquiries asking about it in the same week, it was decided to engineer it for production. This item is used for playing back a guitar (or any other instrument) from a recording system through an instrument amplifier in a suitable room and re-recording the output again, complete with the colour and flavour of the amplifier and speaker with the acoustic of the room. Another item which was introduced due to customer demand is the Dual Channel Micro DI Box which is simply two channels of the very well regarded Micro DI Box circuitry in one case! Very useful for stereo keyboards and similar instruments, but can be used for any other DI purpose as the crosstalk between channels is beyond measurement. 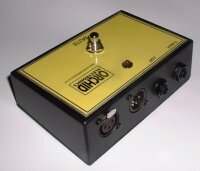 Our various muting boxes continue to sell well, possibly as these are almost unique - and are essential when instruments are tuned, or changed. Similarly, if an instrument is not being played and is put on a stand - it cannot feedback if its output is muted. The fairly new Balanced Microphone Mute has found many uses, especially with musicians using high quality miniature microphones fitted to their instruments- and the Muting DI Box continues to sell well around the world, as it is often favourably commented on in guitar internet web forums - it seems to provide an optimum match for most guitar type pickups. A simplified version of the Balanced Microphone Muting box Microphone Mute lite is available now - this has only XLR in and out connectors - and again has been introduced due to customer demand. It is really good value! Cables don't go out of fashion - even digital mixers still need to be connected to the outside world, so microphone and instrument cables continue to the supplied in large quantities to our customers. They can be sent by post easily - and are always made with the best qualtity cable (Van Damme) and connectors (Neutrik). Cable is held in stock in various colours - and orders are usually made up and sent off on the same day as they are received. On Saturday 7th April Show Of Hands will be playing at the Royal Albert Hall - for the fourth time. Some tickets are still available for this fantastic event, but are sure to sell out by the time of the concert. Steve and Phil will once again prove that they can put on a gig to be remembered. We are looking forward to exhibiting most of our product range at the Analogue to Digital EXPO - to be held in Exeter on Saturday 21st April 2012 in the Phoenix Arts Centre, which is right in the heart of the City. This will be the fourth year that this exhibition has been held - and it has got bigger and better each year. There will be many well known companies involved in recording technology present - so it will be well worth coming if you can easily get to Exeter. At some point in the near future, there will be a review of 3 of our most popular DI Box products in the Sound On Sound magazine. This will include the Micro and Classic DI's and the Muting DI Box - so please look out for this edition. We have always known that they perform really well - and soon there will be published independent confirmation of this! As always - if you have any questions about our products, or any aspect of audio engineering, please don't hesitate to get in touch - we will help if we can. 2010 was a busy year during which several important new products were designed and produced. Considerable design effort was expended on the development of a rack DI box for use with hard disk replay machines employed for sound effects in theatres and backing tracks for bands. A pair of synchronised replay machines can be connected and in the event of the 'main' machine failing, the standby machine audio output is switched - without missing a beat. Switching DI Box Many bands use recorded tracks to augment their live sound - individual tracks coming from a multi channel replay machine can be mixed - and sound amazingly live, until the machine fails...... Hopefully our new design might save the day! 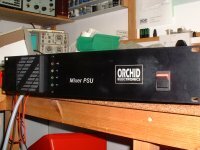 As repairers of mixing desks - we are often requested to built replacement power supplies for 'legacy' mixers (sometimes only a few years old) - because the original item has been damaged, lost or stolen. Often the original manufacturer is no longer in business, or cannot produce the item. Occasionally original fan cooled supplies are just too noisy for recording situations - so we have tried to produce a supply capable of being used with a variety of makes of mixers. Mixer Power Supply Our PSU has a large finned heatsink (much more costly than a cooling fan) - for silent running. It can be used as a redundant back up with many Allen & Heath mixers with the appropriate cable. They have also been used with Amek/TAC, DDA and Soundcraft and Soundtracs models. Please enquire to see if it can be adapted, or is suitable, for your mixer. We are able to send items anywhere in the world - and most are small and light enough to be sent via the 'Small Packet' air mail service. This is relatively inexpensive - and has proven over the years to be reliable, taking about one week to reach most countries in the world, Japan, Canada and Australia for example. There is currently a serious problem with post to the US - due to increased security arrangements demanded by their Homeland Security. Orders to the US will now have to go via DHL/Fedex/UPS at extra cost for the duration of this action. Payment can easily be made in any currency via Paypal, which again has proved to be a safe and reliable means of payment. Our international business has grown over the past couple of years, with many sales resulting from touring musicians using our products - but also due to some wonderful comments posted on Web forums by enthusiastic users! This seems to have the same value as 'word of mouth' - so many thanks to everyone contributing. The Muting DI Box was introduced as a new design since the last newsletter - and in common with some of our other products - came from an idea suggested by a Customer several years ago. This has now become very successful, possibly because it is a unique product, meeting the needs of many players. It received a very good review in Acoustic magazine (Issue 30 June 2009) - as well as gaining an honourable mention on a Martin Guitar Web forum - resulting in sales to the US, Canada and Australia. It is always worth mentioning that despite the fairly low price of our products - they are all hand made in small batches in Exeter UK. Top quality components are used which ensures a long reliable service life. Rigorous inspection and testing ensure consistent, dependable performance - essential for live music use. We are also keen to offer good Customer service - and have actually repaired DI Boxes built 25 years ago (free of charge!). Occasionally we exhibit at small audio gatherings - one such enjoyable event was held at the Exeter Phoenix Arts Centre in March 2009, organised by the Sound Gallery as part of the well established Vibraphonic Festival. The Analogue to Digital Music Expo was very well attended and so will be held again on Saturday March 6th 2010. It is always nice to meet and talk to our Customers and exchange views - please come along if you can. At the same exhibition, Allen & Heath will be demonstrating their range of mixing desks, including new models designed for recording, the well established analogue PA range - and the digital iLive mixers, which are establishing a good reputation. So come along for some 'hands on' experience! We have been repairing A&H mixers for many years now - and can supply and support all models - please ask for a price quote if you are in the market for a good mixer, including the fabulous digital range. Finally - we are delighted with the success of Show Of Hands in the BBC Radio 2 Folk Awards - picking up awards for 'Best Duo' and Steve Knightley for penning the 'Best Original Song'. Congratulations! It has always been my intention to write this Newsletter on a more frequent basis, but despite having plenty to say - there always seems to be more important things to do! These of course include the 3 main areas of business, the first being the repair of audio equipment, including mixing desks - which could be described as a speciality, including Allen & Heath products; over the year we have repaired many of their models from the largest design to the small DJ mixers. Most faults were quickly and easily located and fixed - resulting in small repair charges, making the overall cost of ownership for these fine products to be kept low. Such is their reputation that secondhand prices are generally high (again ensuring low overall lifetime cost) - so consider Allen & Heath if you are looking for a new or bigger mixer in the coming year. Remember that we can supply them at very good prices, delivered directly to your address from their Factory. Ask for a price quote. Last January a visit was made with 2 customers to the Allen & Heath mixer premises in Penryn Cornwall to have an advance look at their new iLive digital mixer. We were given a very exhaustive hands on demonstration of this exciting product - as well as a Factory tour to see how they are made. They are now shipping all over the world - to great acclaim. It was instructive to talk to the people actually involved in the design and support - not just the sales guys (who are also fantastic of course!). Secondly would come product design and manufacture - all undertaken in small batch quantities here in Exeter. This ensures that high quality standards can be maintained - with testing carried out at every stage of assembly. Thirdly are the custom designed items, often employing well proven assemblies from our existing products. We are very proud to know that our many products were used at most major UK festivals, the Albert Hall and at the O2 in London arena for the Led Zeppelin concert. Wow! In April Show Of Hands held their 3rd Royal Albert Hall concert - to celebrate their 15th year Anniversary - this was an extremely enjoyable event, with a sell out crowd coming from all over the world. Congratulations to all the technical staff and musicians involved in this fabulous venture - making it such a success. One of our suppliers of connectors and cable asked if this gig could feature in some of their publicity material, admitting that they had to be inventive to make their important products 'interesting'. Possibly the same applies to our range of 'black boxes'.....! This can be viewed at VDC Trading - and not much music, live or recorded, can be made without cables and connectors! It is always nice when a specially designed item turns into a production version - which happened to the Contact Microphone System - to be be used with one or two attached microphones on such instruments as concertinas, accordians and violins, amongst others. Unlike some competing products, our design is Phantom powered from the mixer - so no batteries are required - a considerable advantage for live music, surely? Similarly, there was demand for a 2 channel, or stereo version, of our popular Transformer Isolator - as it was discovered that this product was totally effective in removing power supply noise when using lap top computers for music replay. So this new product - is now widely used by DJ's, in schools and churches and for conference presentations:Dual Channel Isolator. 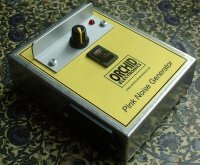 A special version of our Pink Noise Generator was made for use by a major PA supply and hire Company - for fast warehouse testing of speaker systems - all of the drive units checked with one signal. This can be either battery or Phantom powered and is shown on the Custom Products page. If you need to mute a balanced microphone signal - without noise or loud clicks - this can be extremely difficult, especially if your microphone is Phantom powered. However, do not worry, as we have a solution to this problem! Have a look at our Microphone Mute Pedal if you need to do this - it also has outputs for a tuner and an on stage amplifier. Useful if you have a very high quality microphone mounted on an instrument. We are often asked to build replacement power supplies for older mixing desks - it is amazing how often the PSU becomes separated from the mixer during a Studio move, or a sale - or lost in storage. As many manufacturers are no longer trading - or simply cannot make a new PSU, the task falls to us! The supply shown on our Custom Products page was made for a big Soundtracs PA mixer, but was also provided with an additional cable to enable its use with an Allen & Heath mixer for use as a back up if required. Please ask if you might need anything like this. Several rack mounting versions of our Acoustic Pre-amp have been made - including one with very comprehensive tone controls for a customer with 'difficult' instruments. It is still Phantom powered from the mixer and the output can be muted from the front panel, or with a foot switch.Acoustic Pre-amp with Super EQ. If you might like one of the above products, or have any ideas of your own we could explore - pleased don't hesitate to get in touch! Meanwhile - wishing you all a very Happy and successful 2008. It has been a very busy 2006 for Orchid Electronics - and our Customers, with the Summer Festival Season being a great success. It is always exciting to see and hear your equipment being used to great effect on a BIG stage to a vast audience! We have added a lot of new artists to the numbers using our products - some of whom are listed on our 'Links' page. It is always fantastic to see our artists enjoying continued acclaim - with new talent emerging all the time. The Radio 2 Folk Awards are an important event every year - with Seth Lakeman and Show Of Hands being nominated in 6 categories. In addition Karine Polwart and Dave Swarbrick are each nominated in 2 categories. The actual awards will be announced and presented at the glittering BBC Folk Awards event to be held at The Brewery, London on Monday February 5th 2007. They are all enthusiastic users of Orchid gear! On Sunday April 8th 2007 Show Of Hands will again play at the Albert Hall - for the third time! On each occasion our equipment has been used - so we are looking forward to joining the sell out audience for an unmissable experience! Congratulations to Steve and Phil. The Microphone Splitter has sold in good quantities and being of modular construction has been supplied in sizes ranging from a single channel to an order of 3 x 24 channels for an important PA Company in Europe. These were fitted with multipin connectors for fast setting up and breaking down. They have been supplied to studios, PA Companies and TV - for a variety of purposes, including live recording and permitting the use of 2 mixing desks in concert situations. The Acoustic Pre-amp has been supplied in different versions, with a floor mounting type being popular with Double Bass players. Every musician uses different combinations of pickups and microphones - so we have developed our silent muting facility to enable balanced microphones, including Phantom powered types, to be muted without any clicks or noise. This important development will find its way into many products and designs, including one for a highly respected microphone manufacturer. We are always pleased to advise on any aspects of our speciality - from simple advice to product design and small scale production. Times continue to change for recording studios, with many in London and elsewhere closing their doors. There are many reasons for this of course - recording and computer technology now being inexpensive and allowing very high quality results to be obtained at home. However - sometimes it will be necessary to record in a real studio environment - for that special project perhaps. As well as the latest equipment - the expertise and experience gained over many years by the studio engineer will be available - and will prove to be invaluable. In the SW of England - look at the studios listed on our 'Links' page. We are pleased to be able to sell new Allen & Heath mixers directly to our Customers, with many supplied in 2006 - especially the fantastic Mix Wizard models. These are perfect for most gigs and have been well received - with very well thought out facilities. They are more expensive than some of the competition - but are of far better design and can be repaired if necessary in our A&H Service Centre. Regard them as a long term buy - not a 'throw away when it goes wrong' type! Usually works out to be a far better investment over years - and much nicer to use in the meantime. If you are based within a reasonable distance of Exeter consider buying through us - with continued support for the product throughout its service life. Earlier in 2006 we were asked to come up with a bomb proof version of the popular contact microphone system widely used with violins, flutes and accordions. This was a great success - with the Pre-amp/PSU being powered from Phantom from the mixing desk and having a balanced output, so no additional DI Box was required, or internal batteries. This might be further developed to incorporate a balance control for the 2 microphone inputs and a master volume control. If you use this type of equipment - your comments would be most welcome. Photo on Custom Products page. Our simplest product is the Transformer Isolator - which is just a high quality audio transformer in a box! It is, however, a really useful item - and a general interface 'problem solver'. Dual channel versions are also available - these have been supplied for computer laptop connection to mixing desks - as used by DJ's and for recording and replay purposes. All PA Companies need a couple in the tool box to solve those intractable hum loop problems! Most manufacturers of Studio mixing desks have now ceased production - but most of their products are still in use, despite being older than the user in many instances! Spares tend to be available from various sources and support, often from individuals closely associated with the original companies, is usually available. One item that sometimes causes a problem though is the power supply - on occasions these have simply been lost or even stolen. We have built several of these supplies - but might try to come up with a generic type suitable, with appropriate connectors, for use with mixers of many different makes. Let us know if we can help in this area. Almost a year has passed since the last Newsletter - much has been achieved in 2004. One of our important products - the Standard DI Box - has been in continuous production for over 17 years, so was due for a re-design. It is now housed in an attractive and robust extruded aluminium case, with only a slight update to the well proven circuitry. In view of its long history and established position in the Industry, it has been decided to re-name it the "Classic DI Box"! Amazingly the price remains the same. The Acoustic Pre-amp sells steadily, with occasional sales to Canada and the USA - following tours by Martyn Joseph in that part of the world. Martyn will be on tour with Steve Knightley in the UK in March and April - this will be an opportunity to see two brilliant performers work together (as well as an excellent showcase for Orchid equipment!). Go to their Web sites for complete tour schedules - from our Links page. Several special custom versions of this product have been made, including a rack mounting pre-amp with two separate channels - and a floor mounting type with Boss FX footpedal type switches desired by the Customer. These are pictured in our Custom Products section. Making up cables is an important service for our Customers - using Van Damme cable and Neutrik connectors wherever possible. The cost is often less than shop or big name mail order sources - our price quotes always include VAT and carriage, which is charged at actual cost to us. Many cables available from shops are now made in China, usually with cheap connectors - or Neutrik "lookalikes" that certainly do not come from Switzerland! They often cost the same, or even more, than a quality product made to order. Go to the products page and click on Custom cables to view some of our cables. Many Allen & Heath mixing desks have been repaired in 2004 - we continue to be impressed with the design and quality of their products and especially the support received from their factory in Cornwall. We are trying to build up a stock of many of the parts required to speed up repair turnaround time - but most items are quickly available from the Company if we don't have them available. We have been able to widen our Customer base - with Allen & Heath repairs leading on to longer term business relationships being established with these "new" Customers. Don't forget that we have long experience of repairing many established makes of mixers - and most other items of professional audio equipment. Do look at the Custom Product section on the Web site - we continue to produce all manner of items to Customer specification. There are a number of photos of equipment made during the last year in this part of the Web site to give you some ideas! We also make a variety of power supplies to use with Alesis, Lexicon FX units and Boss guitar type pedals amongst many others. Any voltage can be provided - housed in very strong aluminium die cast boxes that can be fitted in the back of a rack, or be left floor standing. Most of the plastic housed "wall warts" - as they are known in the USA - are only fit for light duty and are not able to survive long on the road. Replacements often cost the same as a decent power supply from us, complete with detachable IEC type mains cables and plug in, easily replaceable, leads on the low voltage side. Don't hesitate to ask if you think we can help. One of our early products was a Studio headphone system, used for foldback whist recording. This was designed over 15 years ago - with many sets still in use in local studios to my knowledge. We recently built a special version for live foldback band use, having an input on each individual Musicians box for his own source to be mixed with the composite signal sent from the mixing desk. This has been very well received by all those using it - so may be developed further later this year. Please get in touch if you might find a similar system useful, or have any helpful comments. We were pleased to supply 3 racks of Microphone Splitters to Stage Electrics at the end of November for use on a touring production of the Boy George musical "Taboo" - currently showing around the UK. Also supplied by the Custom products division were 2 X 2U rack cases each containing 6 X balanced line level distribution amplifiers with 1 input to 8 outputs - a total of 96 feeds to be used for the Musicians foldback. During last summer we supplied a small number of special wedge shaped DI Boxes with a footswitch to enable the output to be muted. There was also an output to feed a tuner - with an LED to indicate the status. They were named "mutant" DI Boxes by the happy Customer! They caused enough interest to possibly become a standard product - please let us know if you might be interested in one. We have been an authorised repair centre for Allen & Heath products now for a number of months - this has brought in many new Customers from near and far. This again makes the point (to us) how rare competent and affordable repair facilities are becoming these days. It is also well worth pointing out that the support given to us by the factory (spares and circuit diagrams) has been excellent - bear this in mind when choosing a new mixing desk. Sometimes a cheaper product may not turn out to be such a bargain, if spares and support are not easily available - a mixing desk out of use for even a few days can be a major problem. Custom cables are always in demand - sufficient cable and connectors are kept in stock to enable fast turnaround (often same day) - for normal types. Remember that we can make up any lengths - and can work in Imperial as well as Metric measurements! Neutrik connectors are almost always used as these have proven to be supremely reliable - and are not expensive. Most Customers require black cable - but occasionally we have produced coloured cables - these are no more expensive - and can be useful for positive identification purposes - totally unique! Please note that we are always happy to post items to you - only charging carriage at the cost to us - and have recently sent cables to California (almost coals to Newcastle....!). The Paypal system enabling payment by card has been used for several months now - this is a simple, secure and relatively inexpensive (for us) means of receiving payment. For Customers outside the UK payment can be made in Pounds, Euros or US Dollars. The system will improve shortly as a Europe based version is to be opened - conforming to UK banking laws, allowing even greater user confidence. We make no additional charge for using this method for payment. After a hard day listening to a 1kHz sine wave and staring at the bright green trace on an oscilloscope - there is nothing better than to listen to some good music - we are very pleased to report National acclaim for some of our Musician Customers. Firstly Jas Morris, who plays lead guitar with the Morris Bros Band is the winner of the "Guitarist Of The Year 2003" competition. The MBB play Wishbone Ash and Gary Moore tunes as well as original material - with the always fantastic dual lead guitar stuff - boy this looks good as well as sounding fantastic! Congratulations on this well deserved success - for more information on the band and gig dates - follow the link to their web site from our LINKS page. Finally we are especially pleased to report the award of "Best Live Act" to Show Of Hands in the BBC Radio 2 Folk Awards 2004 ceremony - anyone who has been to one of their gigs will agree the award is well deserved. We are proud to have supplied equipment to Steve and Phil since almost the beginning - the Acoustic Pre-amp having been designed to their exact requirements. Good reports always come back from other Customers for this product - many thanks to Steve and Phil for being such excellent ambassadors (or travelling salesmen) - for our equipment! We often get phone calls asking how Show Of Hands get that sound? Good equipment and instruments, obviously, but in the end talent and hard work does come into it - after all when I play through the pre-amp.......! If you have any comment, suggestions or ideas for future Newsletters - or would like a link on our Web site to your site - please don't hesitate to get in touch. Roll on Festival season weather (sunshine obviously! ).